Enjoy sunny afternoon drives and snowy evening commutes from behind the wheel of a new 2019 Subaru Outback. 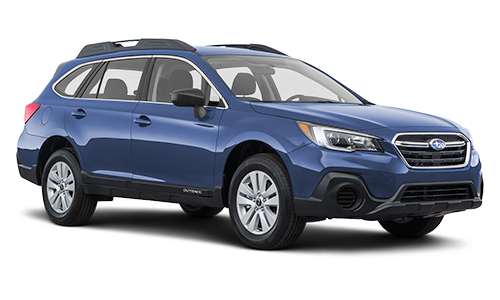 A wide array of available Subaru Outback configurations makes this new Subaru crossover ideal for those who carry a lot of cargo, while standard safety systems help give it the family-friendly title it deserves. No matter if you prefer the Outback 2.5i or the Outback 3.6R Touring, it's clear that this 2019 Subaru model wipes the floor with competitors like the Hyundai Santa Fe XL, Chevy Traverse and GMC Acadia. Get a glimpse at the 2019 Subaru Outback when you visit our Subaru dealership near Papillion, NE. You'll immediately discover that the new Outback crossover boasts the lowest starting MSRP of the group, making it considerably more affordable than its competitors. Yet, unlike the 2019 Acadia, 2019 Traverse and 2019 Santa Fe XL, the 2019 Subaru Outback comes standard with Symmetrical All-Wheel Drive. Cruise across the Great Plains and beyond knowing that the Subaru Outback can earn up to 32 highway mpg, meaning that your stops at the pump will be few and far between. Enjoy enhanced performance when you upgrade to an available 256-horsepower SUBARU BOXER® engine, and rest assured that safety is a No. 1 priority, as the EyeSight® Driver Assist Technology suite of features comes standard across all 2019 Outback trims. With a superb fuel economy, great 2019 Subaru Outback price and a bevy of features for you to enjoy, the new Subaru Outback is perfect for your everyday needs. See why Papillion drivers love the new Outback when you stop in at our Nebraska Subaru dealer today!